To the south of the Cobham Landscape is a valley made by a former tributary (“the Luddesdown River”) that once entered the Medway from the west at Cuxton. 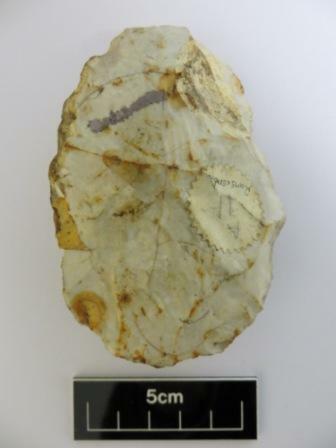 Cuxton is the site of prolific palaeolithic finds in the 1960s, 1980s and more recently, from a small area of former terrace deposit of the Medway. The most notable feature of the wider area is the general lack of palaeolithic material and deposits, other than the single spectacular site of Cuxton. The key questions are: is this because there is nothing there? Or is it because we haven’t yet identified and investigated potentially relevant deposits? There may be other small, unmapped outcrops of terrace deposit in various places. Solution hollows on the North Downs have been identified as a target area for investigation for a current palaeolithic project in East Kent. 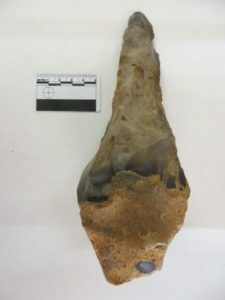 They provide an option to fluvial contexts and the current project is based upon successful experience in locating palaeolithic material in East Kent over the last twenty years. Solution hollows are natural depressions in the chalk formed by the solution of the chalk by chemical weathering which have subsequently been infilled by airborne, colluvial or fluvial processes during the quaternary. Possible solution hollows can be identified from LIDAR views and aerial photography. Ground truthing can then establish if they are natural rather than bomb craters or quarries – possibly by using an auger. The clay with flints could also be investigated as a possible flint source. We have already investigated several concentrations of Mesolithic flint tools in the area mainly in higher locations. The wider Mesolithic landscape that links these sites can now be investigated to further explore its use by early Holocene people. Are the known sites seasonal tool preparation sites of nomadic hunter gathers? 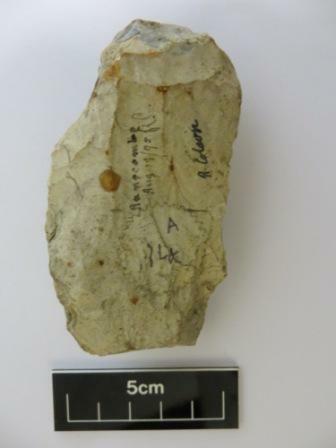 Evidence for the earliest people to use the landscape after the last Ice age (final upper palaeolithic) has been recently discovered at Ebbsfleet Green, just north west of the Cobham landscape and also possibly at the Lidar 5 site in Shorne. This evidence is usually at a lower level than the mesolithic. This investigation can be part of all field walking activities. Later prehistoric flints spreads? Neolithic or Bronze Age barrows or other earthworks? Iron Age enclosure? Are any of the boundary banks in the landscape prehistoric? What is the earliest evidence for settlement? How much is from local sources? What materials did the quarries in the Cobham landscape produce? 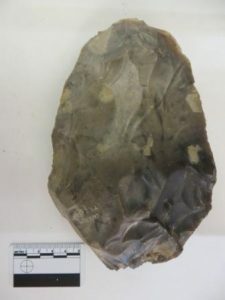 This entry was posted in News & Events, Research and tagged artefacts, Cobham Landscape Detectives, fieldwalking, geology, mesolithic, prehistory, ranscombe farm. Bookmark the permalink. dig . In the late 1970’s my two boys 12 and 10 used to go down on a Saturday in the summer when Fort Amherst was being developed and help with excavating. It was the best day out they loved it. They took packed lunches and a bottle of cold drink and went back and forwards from Rainham on the bus. They would come home dirty and muddy with tales of all they found it was better than digging the garden with Dad.